In the coming months, Singtel will unveil a wellness digital platform that allows customers to earn mobile data rewards with every step they take and also offers content related to health, fitness and nutrition. 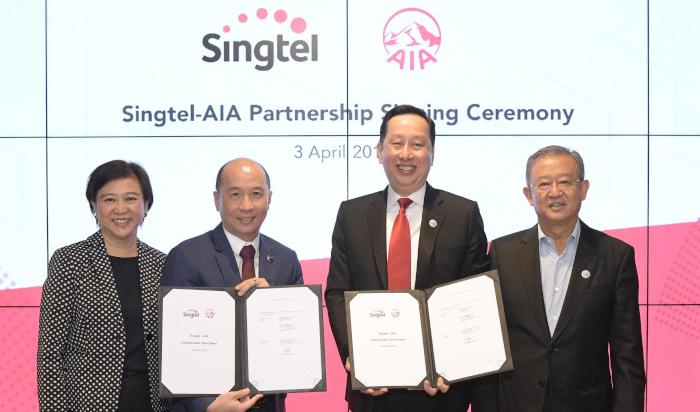 AIA, the largest public listed pan-Asian life insurance group, and Singtel, the largest mobile network operator in Singapore, yesterday announced a partnership to promote consumer wellness. Both companies will team up to digitally engage their combined base of more than 5 million customers and reward them to get active and stay healthy. In addition, Singtel and AIA also plan to co-create innovative insurance products relevant to customers’ increasingly digital lifestyles. This collaboration is the first of its kind between two industry leaders in communications technology and life insurance in Singapore. In the coming months, Singtel will unveil a wellness digital platform that allows customers to earn mobile data rewards with every step they take and also offers content related to health, fitness and nutrition. The platform will sit within My Singtel app which has more than one million active users a month. At launch, customers will also be able to earn lifestyle rewards from inaugural partner, AIA. According to Statista, wellness for the consumer is a fast-growing industry in Singapore with the digital fitness market estimated to grow by 30% by 2022. In December 2018, AIA partnered with MyDoc, a digital managed care platform, to digitally deliver health screening results of AIA Vitality members in Singapore. AIA Group and NWS Holdings, together with other investors led an investment around of $500M for WeDoctor, an online healthcare services company serving the Chinese market and backed by Tencent Holdings in May 2018. WeDoctor said that following the investment and the agreement of a strategic partnership, AIA will become WeDoctor's preferred provider of life and health insurance solutions. “We are pleased to work with AIA on our wellness drive to inspire Singaporeans to lead more active lifestyles. Keeping fit has never been easier with the use of fitness apps, smartphones and wearables to track our health and physical activity,” said Mr Yuen Kuan Moon, CEO, Consumer Singapore, Singtel in statement.